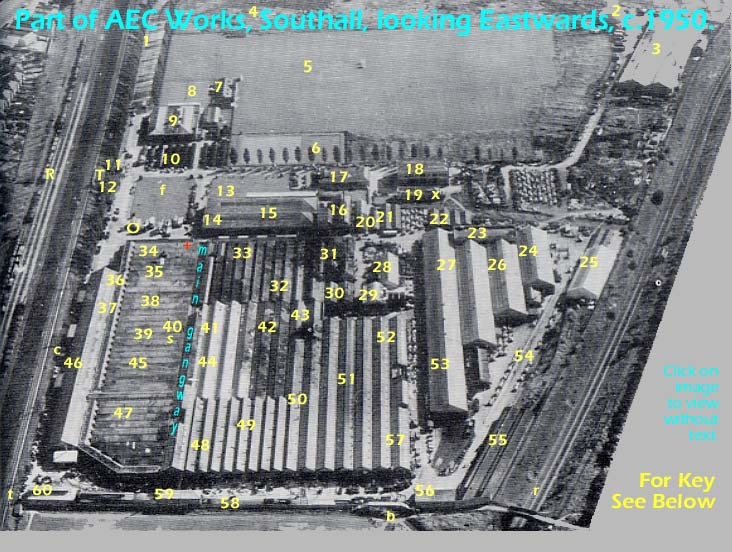 Aerial View of AEC Southall Works c.1950. 18. Main Drawing Office above; Experimental Dept below. 23. Jig & Tool Drawing Office above. 27. Chassis Inspection & Rectification. 29. Emergency Power House (using AEC Engines). 40. Production Control Dept, above. 54. "The Dip" Test Slope. b - Railway Branch Line to AEC. c - Raw Casting Bays. f - Flagstaff. O - Area for Checking Turning Circles. R - Western Region Railway, Paddington Main Line. r - Railway Branch Line to Brentford. s - Safety Engineer, above. T - Pedestrian Tunnel & Shop Kiosk. t - Pedestrian Tunnel & Shop Kiosk. x - Print Room. + - Nurse, with WORKS MANAGER above. UNKNOWNS: Millwrights; Clerk of Works; Paintshop; Stationery. The patchy discolouration of much of the factory roofing may be due to ongoing removal of wartime camouflage paint. On a similar theme, can someone tell us where the factory's air-raid shelters were situated and were they above or below ground. Looking at the photo and remembering the disturbed ground, one can suspect that they were around the western and northern perimeters of the Sports Field. This could be borne out by the following extract from AEC's publication Contribution to Victory, quoted here with kind permission of the BCVM Trust: "On the night of September the 24th, 1940, the Southall Service Department was struck by a bomb which put a large part of the building completely out of action for six months. Happily, workers on the night shift had taken cover in the nearby shelters and not a single man was injured. Damage to the building, however, was extensive the explosion having wrecked the roof, blown out windows and doors, uprooted machine tools and rendered many vehicles unrepairable." The accuracy of the above configuration is not assured. Please forward suggested corrections and additions to the Webmaster. Thankyou.